We offer a free scientific calculator. In addition we are constantly adding new calculators to our site. Here are our algebra, geometry, trigonometry, graphing, and calculus calculators. 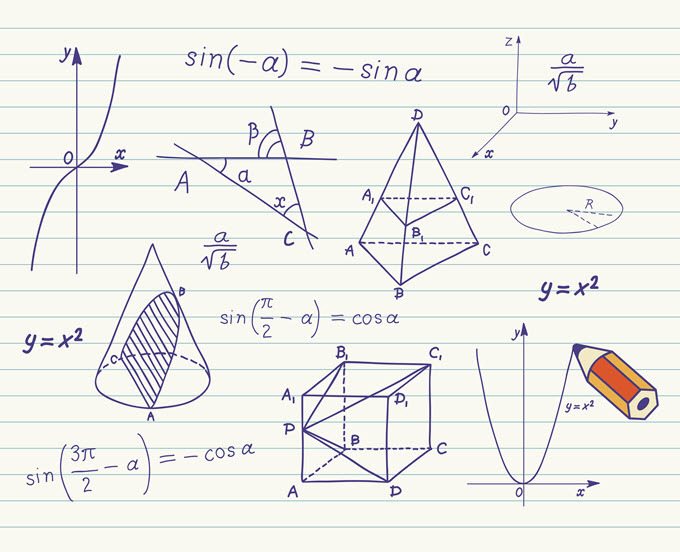 In addition to those category-based collections, in the section below we offer a collection of some of the best math-related calculators from around the web. Operations with common fractions - Add, subtract, multiply, and divide fractions by inserting numerators and denominators. Results are automatically simplified and converted to a decimal. Logarithm - Calkoo application which calculates logarithms and exponents. Per cent calculator - Free calculator for finding percentages. Insert two values and automatically calculate the third. Quadratic Equation Calculator - Solve the quadratic equation. Insert a, b, and c into this calculator and solve for x's two values. Pythagorean Theorem Calculator - Calculates the length of one side of a triangle. Solve the value of A, B, or C by inputting the other two triangle side lengths. Trigonometry Calculator - Solves for trigonometric values like sine, cosine, and tangent. Choose between degree of arc and radian. Proportion: Rule of Three - Calculates ratio equivalents in fraction forms using the rule of three. Insert three numbers and find the fourth to complete the ratio. Area Calculator - Find the area of two-dimensional shapes such as circles, triangles, rhombuses, trapezoids, and more by inserting values in myriad length measurement options. Volume Calculator - Calculate the volume of three-dimensional figures like cylinders and cubes. Results available in English, metric, and nautical cubic length measurements. Add, Subtract, Multiply, Divide - Insert up to four numbers at a time into this free calculator to solve addition, subtraction, multiplication, and division problems. Basic Calculator - Free online calculator with 10-digit keypad and basic mathematical functions. Child Math Tutor - Generate free math problems in addition, subtraction, multiplication, and division for children with this online calculator. Operation checks answers and generates a report card. Exponential Expression Calculator - Insert positive and negative bases and exponents into this calculator to find the product. 4 Percentage Calculators - Four free calculators for solving percentage equations. Find the relationships between numbers and percentages as well as percent increase and decrease. Scientific Calculator - Free online scientific calculator with 10-digit keypad and functions like logarithms and trigonometric calculations. Calculate results in radians or degrees. Decimal to Fraction Calculator - Convert decimals to fractions with this free online calculator. Explanations of involved math functions also available on the page. Fraction to Decimal Calculator - Free calculator for converting fractions into decimals using division. Also explore the related math concepts behind the calculations. Scientific Notation Converter - Convert decimals to scientific notation, or numbers in scientific notation into decimal numbers. The page also explains scientific notation and how to do conversions manually. Fraction to Percent Calculator - Insert the numerator and denominator of a fraction into this free calculator to solve for percentage, decimal, and simplest fraction form. Roman Numeral Converter - Use this free online calculator to convert Arabic numbers into Roman Numerals, or Roman Numerals into Arabic Numbers. Page has a printable Roman Numeral chart. Hex to Decimal Converter - Enter hexadecimal numbers (base 16 numbers with letters A-F) and this calculator converts them into base 10 numbers. The page includes explanations of hexadecimal numbers and conversions to decimal numbers. Decimal to Octal Converter - Free online calculator which converts decimal numbers, or base 10 numbers, into octal numbers, or base 8 numbers. Decimal to Hex Converter - Convert base 10 numbers to hexadecimal terms, or base 16 numbers. Decimal to Binary Converter - This free online calculator translates base 10 numbers into binary. Binary to Hex Converter - This calculator offers an automatic conversion of binary numbers into hexadecimal numbers. Binary to Decimal Converter - Input binary numbers and use this calculator to convert them to base 10 numbers, including numbers with decimal points in them. Multiplying Fractions Calculator - Get the product of fractions, mixed numbers, and whole numbers by inputting them into this calculator. Math Fraction Reducer Calculator - Reduce a fraction to its smallest numerator and denominator with this free online calculator. The calculator also solves for greatest common factor and offers an explanation of math concepts. Adding Subtracting Mixed Numbers Calculator - This calculator adds and subtracts mixed numbers and fractions with different denominators, while offering an in-depth look at the math concepts behind the solution. Adding Subtracting Fractions Calculator - A free online calculator which adds or subtracts two fractions with different denominators, and explains the math behind the equation. Dividing Fractions Calculator - Divide fractions, mixed numbers, and whole numbers with this free online calculator. The site also provides a step-by-step explanation of the answer. Compare Fractions Calculator - Use this free calculator to determine which fraction is larger in a pair of fractions with different denominators. Subtracting Adding 3 Fractions Calculator - Add or subtract three fractions with three different denominators with this free calculator. Mathway - Insert a math problem into the editor and receive a step-by-step explanation of the solution. Problem types range from basic math to calculus and statistics. Statistical Average Calculator - This calculator determines the sum, mean, median, minimum, maximum, mode, and range of a set of numbers. Standard Deviation Calculator - A free online calculator for determining the standard deviation, sample variance, population variance, and mean of a set of numbers. Square Root Calculator - Solve for the square root of a number with this calculator. Scientific Notation Calculator - Add, subtract, multiply, and divide between two numbers in scientific notation. Calculates the solution in scientific notation and in decimal numbers. Exponent Calculator - Enter a base and an exponential power into this calculator and receive the result in decimal number form. Prime Number Generator - A free online tool which generates prime numbers. Select the desired number of primes, and a numeric range within which to find them, and the tool creates a list. Prime Number Calculator - This calculator checks whether or not entered numbers are prime. Percentage Change Calculator - Determine the percent change, the fractional change, the numerical difference, and the percentage difference between two numbers. Percent Calculator - A calculator which solves the equation number A is what percent of number B. Enter any two of the three fields to calculate the result. Prime Factoring Calculator - Find all the prime factors of a number with this calculator. Online Factoring Calculator - Generates a list of all factors, prime and composite, of a number less than 10 million. Linear Equation Solver - This free online calculator solves linear equations for a single variable, and lists step-by-step how to manually solve the equation. LCM Calculator - Find the least common multiple for between two and four numbers with this calculator. Greatest Common Factor Calculator - Enter two, three, or four numbers into this online tool to find the greatest common factor of the numbers. Operations with polynomials calculator - A calculator which will add, subtract, multiply, or divide two polynomial expressions. The calculator offers the option of generating an explanation for the solution. Synthetic Division Calculator - A free online calculator which computes the synthetic division of polynomials. It also finds remainders of synthetic division and determines whether one term is a factor of the other.